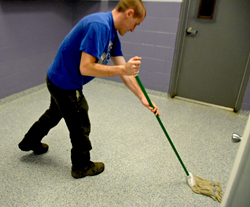 Mops, brooms, sponges, and cloths are just a number of cleaning tools sent to each shelter. The Libman Company, a 120-year old Arcola-based cleaning products manufacturer, has donated hundreds of its household and commercial cleaning products to various local animal shelters in the greater Champaign-Urbana area. “Animal House Shelter would like to thank Libman for their generous donation of cleaning supplies,” said Cindy Ritter of Animal House Shelter in Huntley, Ill. “This donation helps us keep our shelter spotlessly clean so that our animals can enjoy a sterile and healthy environment,” said Ritter. The Animal Shelter House is a non-profit, 501(c) 3, no kill shelter that rescues, rehabilitates and adopts out all breeds of dogs and cats. Other animal shelters that received Libman products include the Vermillion County Animal Shelter in Danville, Ill. and Prairieland Shelter in Champaign, Ill.
“We’re happy to be able to donate products that can really make a difference in the day-to-day operations of our local pet shelters,” said Andrew Libman, president of The Libman Company. “These organizations work tirelessly to positively impact our own communities and we are proud to support them,” said Libman.